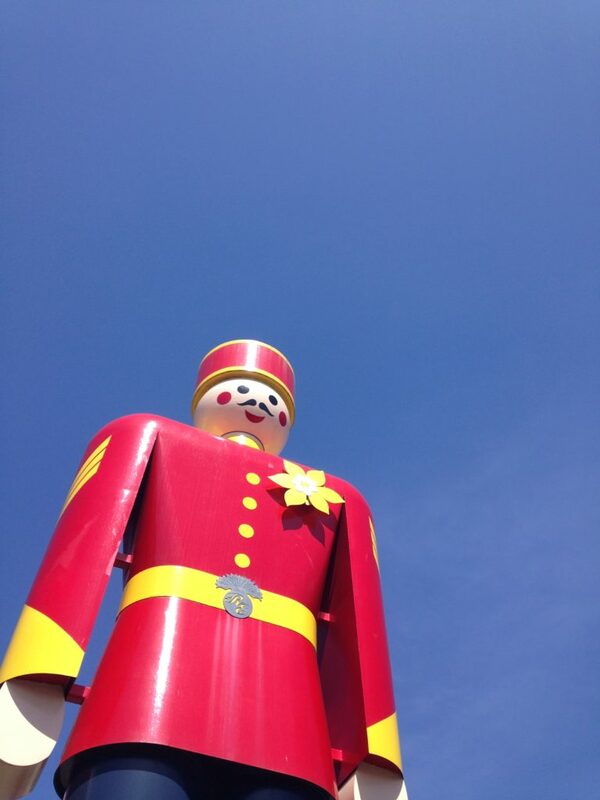 New West’s beloved, iconic, unnamed, and decidedly “non-moving” Tin Soldier is the official World’s Largest Tin Soldier. He stands a whopping 9.75 metres tall & weighs 4,540 kilograms. He was designed and built in 2000 by Austin Metal Fabricators, the Sheet Metal Workers International Association Local Union 280, and the BC Sheet Metal Association (SMACNA- BC). Danny Jay, the designer, had a friend stand at attention to get the proportions right when sketching out the initial design. It took more than 500 hours to build and paint the soldier. Many people contributed to the development of the Tin Soldier, including Wayne Wright, before he ran for and became Mayor, and Cheryl L. Gauld, the then-Director of Development for the Simon Fraser Society for Community Living. Originally the soldier stood in front of the Armoury on 6th Street. In 2011, he was gifted to the City of New Westminster and relocated to his current post at River Market at Westminster Quay. While the Tin Soldier has dressed up as a ghost for Halloween and has worn a special pin for Honour House, his regular uniform is that of a Sergeant Major Soldier from the Royal Engineers, who were pivotal in establishing New Westminster in 1865. His belt buckle is the Royal Engineer insignia, and his gold heart (which is under his daffodil brooch in our picture) symbolizes the spirit of kindness to others. The soldier has both a time capsule and a geocache on his person and has starred in a children’s book. New Westminster’s Tin Soldier is very proud to be a special friend to all children and remind them to open their hearts and help others less fortunate.